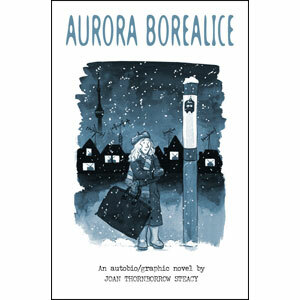 Joan Thornborrow Steacy will debut her autobio-graphic novel Aurora Borealice at the Toronto Comic Arts Festival, May 7-8 2011! Douglas Coupland – Generation A, Player One, Marshall McLuhan: You Know Nothing of My Work! “The Imagery of a half-built CN Tower loomed over this book well after I’d finished reading it. Joan has managed to structure a graphic novel around a time and place that I never experienced but am now nostalgic for nonetheless. Like the unfinished architecture inside, Joan is attaining majestic artistic heights here while circumcising the medium and leaving us with Canada’s latest freestanding masterpiece. A beautiful, heartfelt triumph”. This entry was posted in 2011 Releases, Press Releases, Publishers by Kevin A. Boyd. Bookmark the permalink.